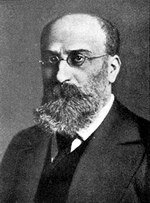 Guido Adler (1855-1941) was the first one in studying Socotran folk music. He was a world-famous professor of music history, Head of the Vienna Conservatory of Music, the founder of the Institute of Music History and chief editor of “Memorials of Music Art in Austria”. It was Guido Adler who stated that he managed to find Antonio Saliery’s notes where he confessed to poisoning Mozart. His article "Sokotri-Musik" issued in 1905 is still quoted by musicologists.